Finally! 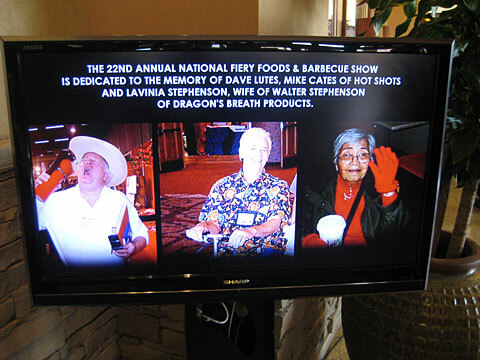 Here’s my diary from the 22nd Annual Fiery Foods and Barbecue Show which took place between March 5 – 7. I probably should have broken it up into days and slapped together several blog posts out of it; but you know me, always doing things the hard way. The weekend began Thursday morning. 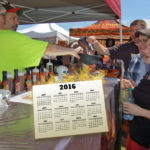 Thursday of course was a setup day for vendors at the Fiery Foods Show but a travel day for hot sauce aficionados from all over the country and the world. My flight from my hometown of St. Louis to the connecting airport of Dallas-Ft. Worth was pleasant but landed later than scheduled, so I had to literally run like O.J. Simpson in the old Hertz Rental Car commercials to reach the other side of the airport (with a short tram trip in the middle) where my connecting flight to Albuquerque awaited. I had literally three minutes to spare before takeoff. Because of the marathon-caliber dashing to the gate – I had not run like that in years – I developed severe shin splints and sore ankles on the plane and this affliction caused me walking problems the rest of the weekend (luckily the pain subsided somewhat by Sunday). But thankful to reach my transportation in time, I crashed and slept in my seat, but not before greeting Jim Beckett of Jungle Jim’s who was traveling on the same flight from DFW to Albuquerque. 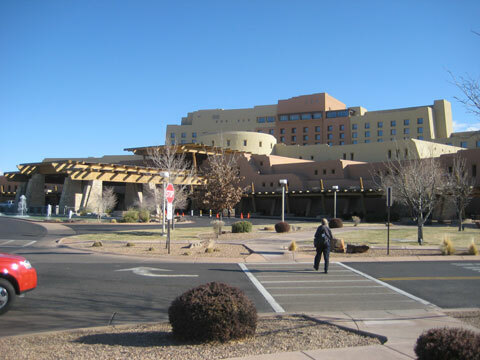 Following arrival in New Mexico, I snagged my rental car and scoped out the hotel. With a few hours to kill before my fellow compatriots in blogging showed up in Albuquerque, I drove up to the Sandia Resort & Casino (which was only one highway exit north of the hotel) to see if any exhibitors were still hanging around after booth setup. I ran into John and Maggie Dilley of Defcon Sauces and “Chilehead Ed” Rome of Redrum Hot Sauces and we all decided to munch on a late dinner at the Council Room Restaurant at the Sandia. 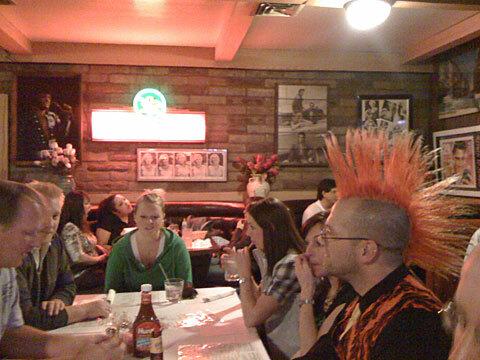 Light and fun conversation abounded, with discussion including the new Defcon ZERO bottles, the Deathmatch Mk III sauce (it was humorously suggested that it be both glow-in-the-dark, and contain Ipecac for an added pukage factor at Deathmatch wing contests), and the Dilley’s new pet rabbit named “Nugget Von Beelzabunny, Destroyer of Worlds” (I kid you not), making us partially forget about The Council Room’s slow and unresponsive wait staff. The label’s not ready! Back of the ZERO bottle. At dinner’s end, Ed drove to the airport to pick up fellow blogger and chilehead Al “Buddah” Goldenberg plus a new addition to the bloggers clan, Mike Wilbur of hotsauceguru.com, while the Dilleys went back to their room upstairs at the Sandia to recuperate after a long day of getting their booth ready. I sojourned back to the hotel before giving Joe Levinson of The Hot Zone Online (with whom I was sharing a room) a lift from the airport. I found Joe wearing a Cubs jersey, while I was wearing a Cardinals shirt at the time. Funnily enough, no mention of a Chicago-St. Louis rivalry was ever brought up the rest of the weekend. Long day at the show. As our core chilehead group (Buddah, Ed Rome, Mike Wilbur, Joe Levinson and myself) who were staying at the hotel grabbed our complimentary breakfast, we saw some other familiar guests, which included Johnny and Nichole from Heartbreaking Dawns Hot Sauces and Sam & Tina McCanless and Mike of Zane & Zack’s World Famous Honey Company. 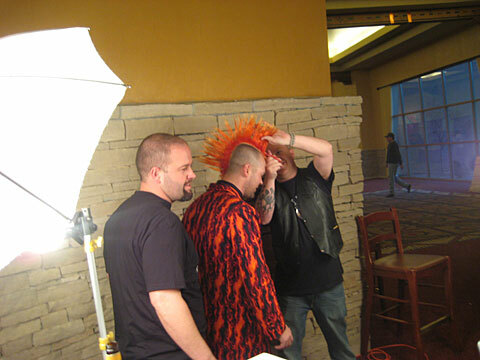 Sam was sporting a huge mohawk which had surpassed what even Danny Cash has sported in the past. Was this signaling competition between Danny and Sam? At this point, we didn’t know but we expected a fun day. 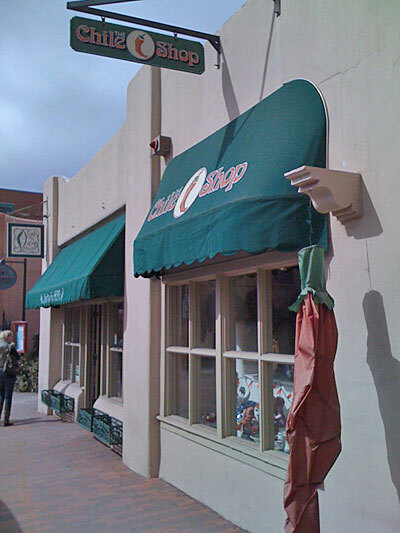 We drove up to the Sandia for what were the “Trade Only” hours – 9 am to 4 pm this day – for we would avoid the crowds and get “first shot” at whatever the vendors had in store at their booths. With the help of the extraordinarily nice Emily DeWitt-Cisneros (niece of Dave DeWitt and Co-Producer of the show) we got our “media” badges and ventured into the show area. 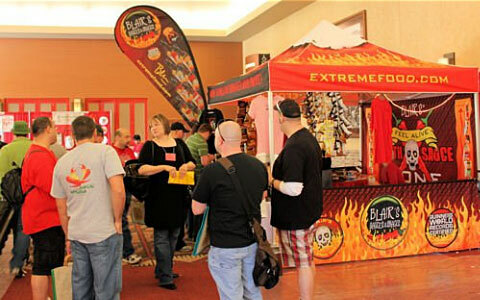 Pace Foods, Blair’s and Danny Cash were among the first booths in the main hallway outside of the main ballroom after walking past the ticket tables. 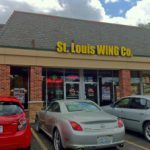 It was around this area where we met well-known chileheads such as Art “Xero” Weingartner of Xerach’s Salsa and his son A.J., “Cheffy” and his wife, Vic and Wendy Clinco, and later in the day Robert “Parker” Bates arrived, who would stay with us at our hotel. 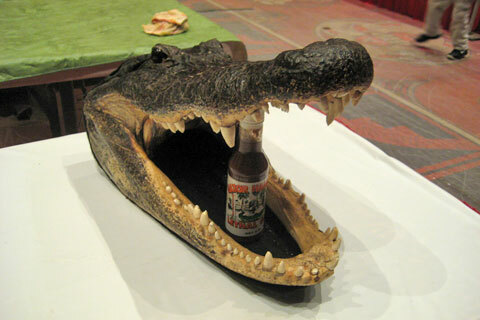 We made our whirlwind jaunt around the show floor meeting old sauce company friends, making new ones and testing & tasting many, many great products. 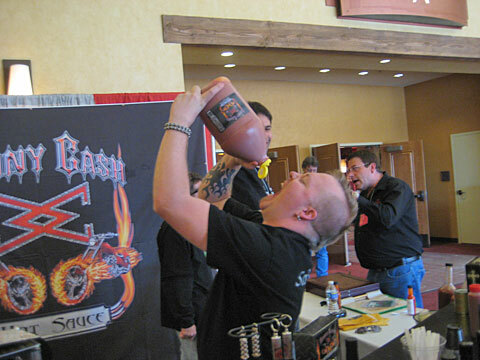 Overall there was nothing new that “wowed” me in the hot sauce world. There were a lot of confections and tasty snacks, and if there were any emerging “trends” we saw during the show it was the growing number of booths containing displays of spicy peanut brittle, caramel corn, chocolates & candies, chile-infused beef jerky and more. One notable snack was Deano’s Jalapenos, fried jalapeno slices covered with a delectable cheese powder and tasted like delicious jalapeno/cheddar cracker bites. I met Anna Shawver and company at Apple Canyon Gourmet, who make some of my favorite salsas on Earth (in particular their Flamin’ Pineapple). I also tasted some terrific sauces as well as their yummy margarita mix. While browsing the show floor I ran into Derek Riches, a barbecue and grilling expert who can boast having the most visited BBQ webpage on the interwebs at http://bbq.about.com. It was cool that he recognized me, and we talked for a short while about BBQ and hot sauces, and both of us agreed that when you get right down to the nitty gritty, flavor trumps fire every time. Several times Buddah would gather three or more of us to do live, impromptu reviews of products that he caught on his Flip camera. 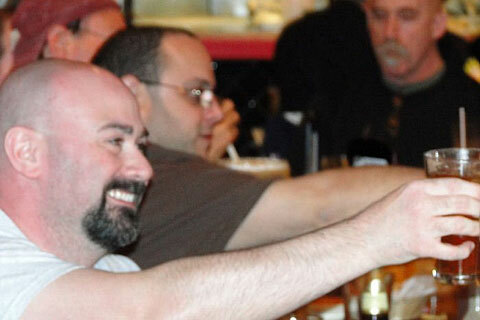 It was usually Mike, Joe and I tasting a small amount of sauce and getting our initially reactions. Another highlight of the day was finally meeting Mike and Diane Greening of Mike and Diane’s Gourmet Kitchen. I wanted to get a photo of the couple, but the camera-shy Diane didn’t want to do it. I finally was able to talk them into it, and Diane was even gracious enough to let me pose with them in the photo. Once the crowds started building around 3:30 PM to be let in the show, we knew it was time to wrap up our sampling and gabbing and get out of Dodge before we got stuck in the stampede of public show goers. While waited for our group to congregate in the Sandia’s lobby, I went over to the lobby’s coffee shop to buy a soda and bumped into Blair Lazar and his wife Kari. They invited me to sit down with them for while and talk about various topics. 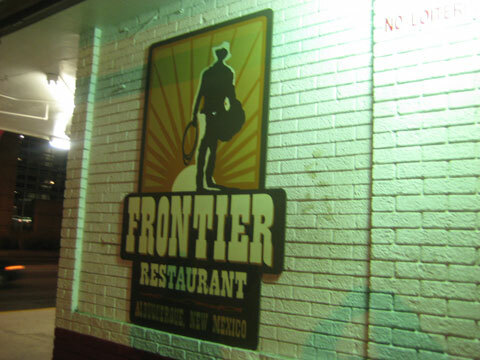 We left from the show in early evening, and our blogger/chilehead clan went for supper at Frontier Restaurant, a popular eatery across from the University of New Mexico with ridiculously cheap prices geared towards college students but was patronized by folks of all ages. The food (they offered everything from fast food to Mexican/New Mexican cuisine) was okay but the low cost made it taste instantly better. 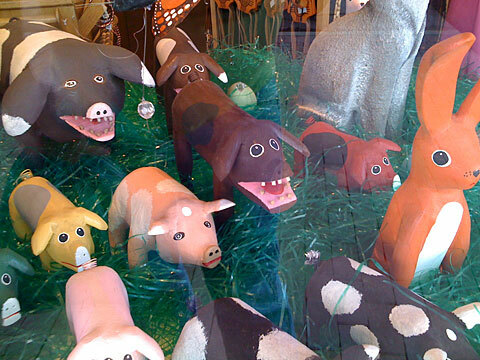 We hoped to have been joined by a few of the exhibitors from the show, but alas no one else showed up. 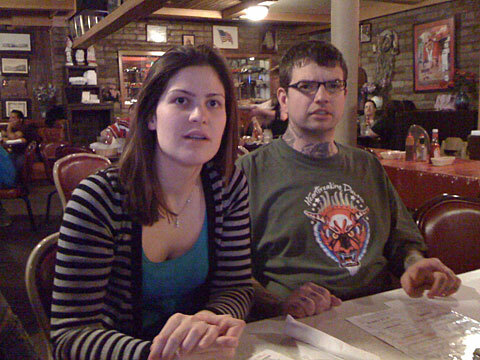 The dinner was still fun as we talked about the day, cracked fart jokes and made fun of the “Evil Elvis” painting on the wall. The later half of the evening consisted of our clan – Ed, Parker, Buddah and Mike in one car, and Joe and I in another – searching for a drugstore of some kind. Our needs for getting to such a retail outlet were varied, but one of the main ones was to find some air freshener. Why may you ask? Well, let’s just say that the New Mexican meals being consumed in addition to all the salsas and sauces we ate at the Fiery Foods Show made all of us a little…flatulent. Joe and I alone tore up the interior of my rental with our combined odors, so I could only imagine the quadruple stench level of the guys in the other vehicle. I was told it was the stuff of legends, and it became one of the running jokes of the weekend. Joe and I arrived at the hotel before the other car did. 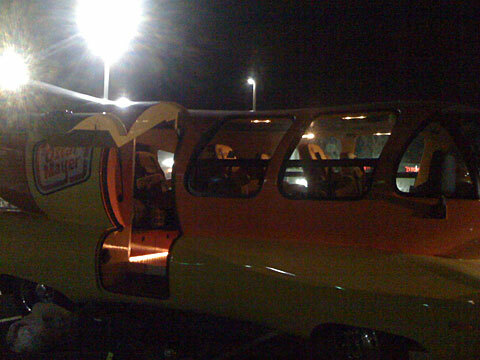 To our surprise was the Oscar Mayer Wienermobile sitting in our hotel parking lot. The five-year-old kids in us came out as Joe and I became giddy with excitement for this vehicle shaped like a hot dog. We parked next to it and was fortunate to find that the driver was still unloading his luggage. He kindly gave us wiener whistles and “I Saw It!” stickers and even snapped a photo of us standing beside it. To this day we have no idea why the Wienermobile was in town – it stayed at out hotel all weekend but had nothing to do with the Fiery Foods Show – but was an unexpected treat to our visit. Buddah says he’s had a lot of experience with hypnosis, both studying it and trying it out on others. Long ago he said that he wanted to test out if properly put under, a subject could be influenced to remember a trigger word, and when hearing the trigger word or phrase when fully awake, could have the fiery sensation of capsaicin be turned off. Now personally I’m a skeptic and a myth buster in many ways, but I have seen legitimate displays of hypnosis and thought, “what the hell, I’ll try out Buddah’s little experiment”. Buddah had me lie down on my hotel bed as I was relaxed and had me go through the hypnosis process. I’m not going to repeat everything that was said, but Buddah essentially provided the trigger phrase of “heat off” that only he could say to take away the effects of a hot sauce burn. Both he and I were given “permission” to turn the heat back on at our discretion so that I could once again feel the heat of spicy foods if the hypnosis worked. The session was over after 20 or so minutes. I woke up early and recorded & uploaded a quick video for the hot sauce giveaway contest I was having on my website while Joe was sleeping. Day two of the show, with Trade-only hours lasting from 9 to 11 am, and lot to do today. After a quick video review of a few hot sauces, Buddah and I were eager to get the hypnosis project rolling. First, we stopped by CaJohn‘s booth for a trial test on Holy Jolokia. This was a sauce I was familiar with, and while it doesn’t possess extract-level heat it can still light a fire in your mouth. 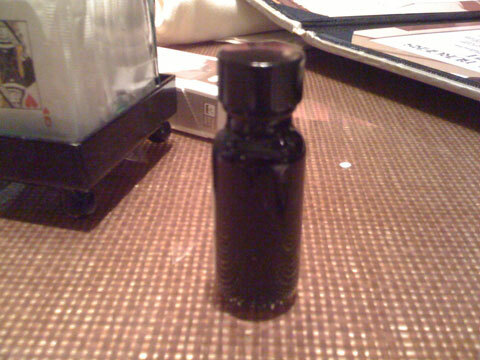 Buddah gave me the trigger words and I took a shot-sized swig of it. 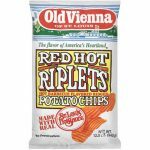 The vinegar and other flavors were more pronounced that I had remembered them, but alas the heat did creep in even if it did taste less potent. Sensing I needed more hypnotic reinforcement, Buddah led me outside to the quieter patio area to put me under for about five minutes. We went back in so that I could take a stab at the German Chili Police‘s Painmaker extract sauce. I was fed a small spoonful of the 500,000 SHU liquid and I immediately sensed a bitter ,tea-like flavor. All due respect to my Teutonic brethren, but the taste was plain nasty. While this happened, I expected a delayed heat to kick in but never did. Weird. I got watery eyes and a saliva build-up on my tongue, both reactions to super spicy foods, but I never felt the burn that caused them! 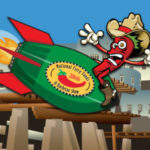 Next was Defcon’s ZERO, which raised the ante to 2 million Scoville Units. I wiped all sides of the straw on my tongue and waited. The taste was slightly better than Painmaker, but strangely no heat. I’m dead serious. In fact, the bodily reactions (increased saliva, teary eyes) were even milder than with the Painmaker. I think John Dilley might have actually been a little surprised at this. To conclude the experiment, we strolled over to CaJohn and I got a good dosage of Black Mamba (around 2 to 3 million SHU) on a little spoon. Once again I received the flavor of the sauce, including tartness of vinegar, but no burn. There was a sensation of what I can only describe as heat “trying to break through” yet never reaching a point where it was fully detectable. It’s like being almost able to “smell” something sealed in Saran Wrap but never making direct contact with the odor. At this point I was able to detect some numbness on my tongue and some saliva, so I probably sounded like a sputtering idiot when I talked. My verdict? There may be some truth to this stuff. I’m not going to fully jump on the hypnosis bandwagon until there are additional tests done. I would like myself (or someone else) to replicate these and other extract sauces perhaps at this year’s Weekend of Fire. I think it would also be interesting to try this with eating raw chile peppers. How weird would it be for someone to chomp on a whole bhut jolokia or trinidad scorpion and not feel the burn? Well, I may be getting ahead of myself. When reflecting back on this hypnosis episode, I couldn’t help but think that maybe I told myself so much in my mind that this would work, and really WANTED it to work, that my own brain “turned” the burn off? Whatever the origin of the “switch off” was – being hypnotized or my own will power – it seemed that I was able to tap into something. But like I said, a helluva lot more testing has to be done, especially to other people and see if similar results can be obtained. Prior to the show, Buddah had set up for me to do an interview with Mike Greening while Buddah recorded it on video for I Love It Spicy. 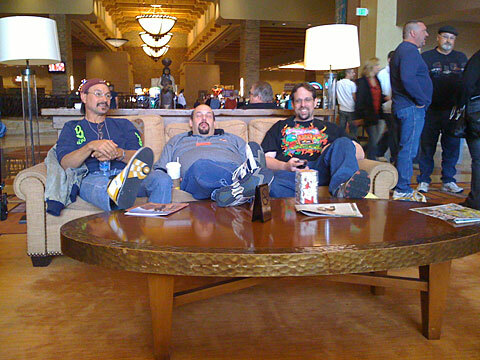 At the predetermined time, Mike, Buddah, Joe Levinson and I sat outside the Sandia in the patio around one of the huge circular, padded seating areas that surrounded (at the time unlit) fire pits we dubbed the “Rings of Fire”. It was the perfect setting to talk to the maker of Ring of Fire Hot Sauces in the fresh, sunny morning air. My longtime respect and “hero worship” for Mike was certainly not unfounded; he proved to be a quality individual with honest and grounded opinions as he talked about everything from his origins in the hot sauce world, his dealings with rock bassist Michael Anthony, his new, upcoming spice rubs to his views on the hot sauce industry. 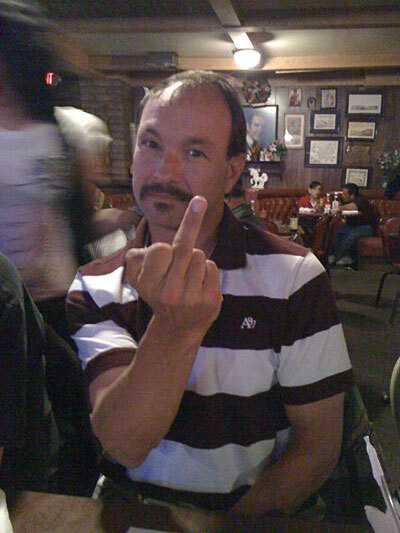 He’s a simply class act and a nice guy. Joe Levinson sat in during the interview and even asked Mike a question or two. The whole thing went very well and I could have even imagined Joe joining Mike and I and having the interview go on for two hours, but schedules were tight and we had to wrap it up after approximately one half hour. 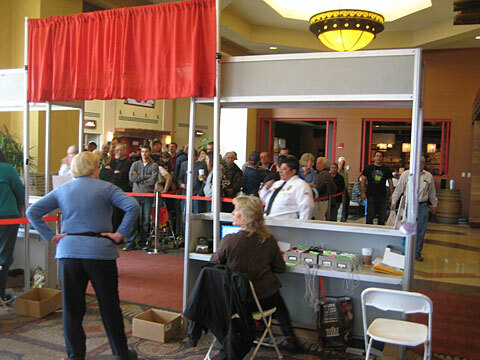 We wanted to avoid the “Gates of Hell” (AKA the public, which were allowed to go into the show at 11:00 AM). 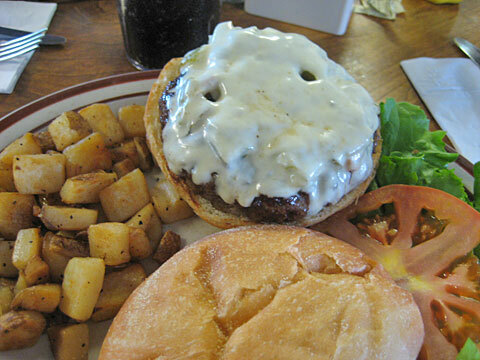 Our core group traveled up north to Santa Fe to try a green chili cheeseburger featured on Drive-Ins, Diners and Dives at the Bobcat Bite Restaurant. Ed and Parker went in one car and wanted to take a scenic route through the mountains while us remaining four opted to get up to our destination quicker taking the Interstate. 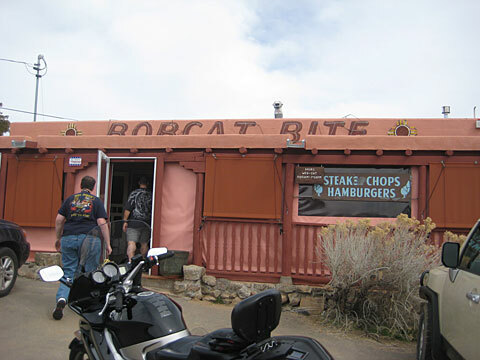 Using the newly-dubbed “JPS” (Joe’s version of GPS in his brain) we found what was almost a little shack by the side of the highway, displaying the words “Bobcat Bite” and knew this was the place. The burgers are good (maybe 7 or 8 on a 1 to 10 scale) but the green chiles lacked a lot of punch and pungency flavor-wise. This was representative of just about all green chiles I tried while I was in New Mexico – semi-flavorless and watered down, as if EVERYONE got them out of cans. I was dying for some fresh-roasted green chile peppers. I was able to tolerate the relative blandness, but Buddah thought even worse of them. After lunch, we drove into downtown Santa Fe and walked around the streets surrounding the historic town square. We came upon the usual restaurants and touristy shops but several sold hot sauces, salsas, seasoning mixes and chile pepper-related items. The weather was perfect: cool in temperature, but the clean air contained light breezes of warmth from the afternoon sun. We departed Santa Fe, and Joe, Mike, Buddah and I went to look for a liquor store for tequila connisuers Joe and Mike. 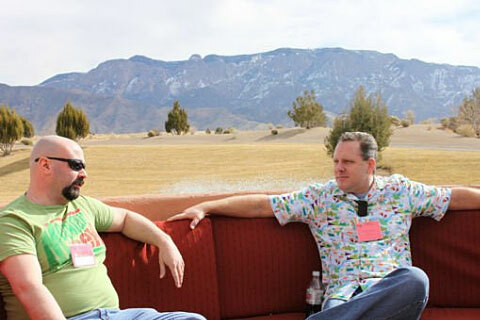 Then, a visit back to the Sandia for more show coverage. 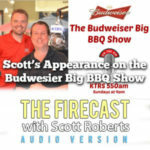 At the show I stepped outside in the patio and chatted with my friend Brian Meagher of Hot Sauce Daily and gave him a brief “man in the street” report for his Hot Sauce Weekly podcast. I later learned that Buddah did the same, and (here’s some promotion for Brian) you can listen to our phone reports on episode 16 of HSW. CaJohn introduced Joe Levinson and I to Dr. Paul Bosland, director of the Chile Pepper Institute. 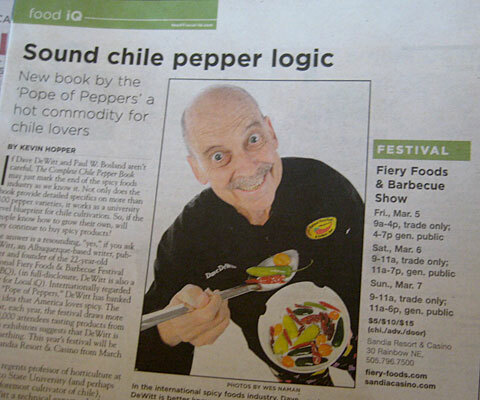 Paul was gracious, accommodating and down-to-earth, as well as being expectantly well-versed in chile peppers as we asked him several questions. It was another “rock star” moment for us. Overall I met a lot of cool, new chilehead friends and sauce makers, including Rose Seymour from Chillipepper Pete of the UK (whose lovely British accent enthralled both Joe and I), Jeff Meeker of Hot Heads Pepperspread, Mark Vinson (Mvinson for the Hot Pepper forums), and many others. 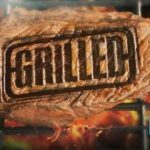 That late evening our blogger cartel crew plus Mark Vinson met with Johnny and Nicole from Heartbreaking Dawns, the Zane & Zack’s crew and the Sunshine Sauces crew for a steak dinner at the Monte Carlo Steakhouse. A good time was had by all. Parker thinks I’m number one! As much as I enjoyed the first two days at Sandia attending the show, I was really looking forward to this less-hectic day. Friday was a marathon going around to the booths, and Saturday morning’s limited hours were dominated in with Buddah’s heat experiment and the Mike Greening interview. But today I got to peruse the aisles at my leisure and actually make my product purchases. I had previously written down what I would buy from what booths, but in typical Scott Roberts style I forgot my list. I had to rely on my memory on what were, and I KNOW that I forgot a product or two. I also got to do a bit more picture-taking than on previous days. Our core group of six went out to lunch. At the recommendation of some locals, we attempted to brag a bite to eat at a joint called Duran’s Central Pharmacy, but unfortunately they had already closed for the day – they lock their doors after brunch time (it had nothing to do with them seeing our ragtag group pull into the parking lot…I swear!). We drove cater-cornered across the street from the Pharmacy to an unassuming restaurant named Garcia’s (also recommended by people). They served New Mexican food which most of us agreed was “good but not great” (but we loved their honey-drizzled sopaipillas). The most memorable part of lunch was the fact that poor Parker popped his knee completely out of socket while merely sitting at the table, and since I was the one sitting next to him I got the bejezus scared out of me as Parker all of a sudden fell out of his chair with a bang. Parker sat on the floor for several agonizing minutes trying to shove his knee back into place (he later informed us that this has happens to him about every six months or so) while the rest of were helpless to do anything for him. You know those solemn instances (church is a classic example) where you’re not supposed to talk or laugh or else you’d be deemed as acting grossly inappropriate? Well, the tiniest thing was able to set us off into nervous tittles while simultaneously trying to respect Parker’s predicament. What made it worse was that Parker had laughed at one point during his excruciating ordeal, so was it okay to laugh right along with him or sit in respectful silence and wait? Thankfully Parker was able to snap the joints back together and he suffered no additional pain from there on out. Lunch was done. Mike Wilbur was driven down to the airport to fly back home, and I dropped off a few of the other guys off at the Casino for them to do a bit of gambling. This gave me a few hours to divulge in a short nap and to start packing my bags for the flight home the next day. James Beck gave me a call around 4 o’clock and informed me of a small but a show-stopper of an event to close out the Fiery Foods Show. 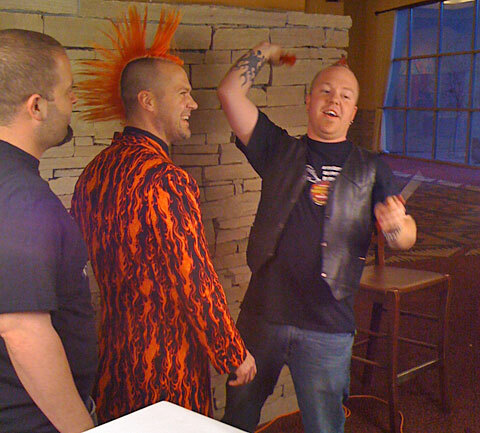 Danny Cash was to cut off the mohawk of Sam McCanless, and it would recorded live for the SpicyRV.com video feed. I was planning on going back up to the Fiery Foods Show one last time that late afternoon to pick up the guys, but for this last mini-event I made sure I had my camera in tow and high-tailed it back up to the Sandia. Danny throwing the first handful of hair to Sam’s wife Tina. I have a small lock of this I took with me back to Missouri. 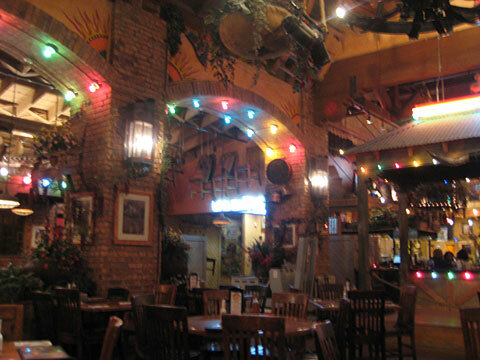 Buddah had organized a giant post-show dinner at Garduna’s Mexican Restaurant. By this time all we wanted wanted was a good meal in our bellies, a few drinks and pleasant company. We got all three. Joining Ed, Joe, Buddah, Parker and myself were the CaJohn’s crew, the Chili Police of Germany, the Danny Cash clan, the Sauce Goddess Jennifer Reynolds, Chuck Evans of Montezuma Brand, Doehne and his wife from Deano’s Jalapeno’s, the guys from Voodoo Queen hot sauces, Mark Vinson, Vic and Wendy Clinco, the guys from All Spice Cafe, and part of James Beck’s SpicyRV gang. My Monterrey Chicken and enchilada were hands-down the best meal I had all weekend. I had concluded that in general, New Mexico-style cuisine (namely foods that included green chiles) was decent but overrated. Making a toast. Myself, Buddah, and JD Cowles of All Spice Cafe in the background. 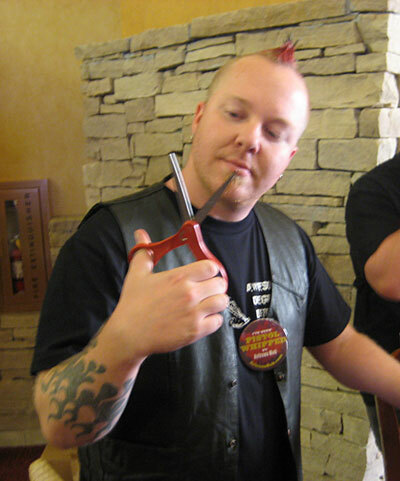 Mike Wilbur of HotSauceGuru.com was a cool guy to hang around and a great addition to the “Blog Cartel”. I look forward seeing what else he has in store for his website (be sure to check it out yourself) and look forward to seeing him at future hot sauce shows. 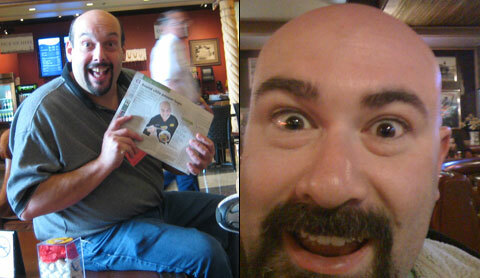 Joe, Ed and Parker are both fun and funny to be with, even when Parker turns into Fartman. Buddah can be trying sometimes with his non-stop motormouth but he’s a great friend-in-chiles. Just like me and the other bloggers he has a passion for the industry and wants to help promote it and see it grow by leaps and bounds. I met so many kind and interesting folks who put their hearts, their souls, their time and their hard-earned cash into making a product or a group of products. Some are well-known to the chilehead community and others are beginning their journey into this field. Many will not survive but some will, but no matter what is their destiny I salute them all. 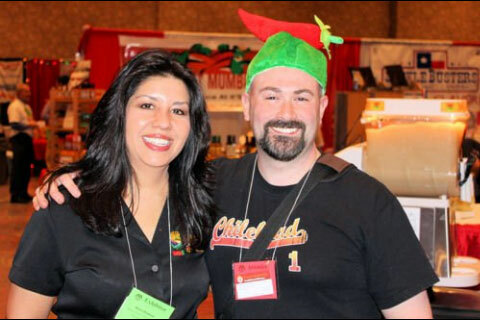 These people are the heart of the spicy and specialty foods industry and through their great products help make us the fanatics that we are. It was great meeting the whole Spicy RV gang – Jay Rascoe (Guns and Tacos), Jason Russo of Texas Foods, Paul Sedillo and of course James Beck who’ve I’ve known before he hooked up with Dave DeWitt. They did a fantastic job of setting up and recording interview segments from the show (you can view all the video archives at http://www.ustream.tv/channel/spicyrv). The only gripe I would have is that the link to view any of this video was not well communicated before or during the show. Not a word was mentioned on the fiery-foods.com website about live video, and James’ eatmoreheat.com didn’t have any reference to the video feed until Saturday. Other than this minor snafu, I recommend watching the interview videos (keep an ear open for James’ humorous jab at me during the CaJohn segment) and sheds light on what may lie ahead technology-wise for future shows. A big thanks goes to Joe Levinson and Mark Vinson for additional photography. Spice It Up St. Louis at White Castle with Scott Roberts to Benefit Wounded Warriors!